What is the number of bookings per day by Avis India? What is the expected growth in revenue in 2012 compared to 2011 and what is your current market share in organised car rental segment in the country? At 2000 booking per day, Avis in India has a market share of 20 per cent at approximately Rs 140 crore. We also have been growing at a constant rate of 30% and the same is expected this year as well. Our growth figures are double than that of the industry. You have been promoting self drive packages in India. How is the response? What factors are preventing the self drive in India? IS it higher rental per day compared to other countries or some others factors? We have seen a very good response to our self Drive promotions. There is a clear sign for growth for Self Drive which though slow is now definitely on a growth path. In India, Self Drive is at its infancy. Around 5 per cent of our turnover comes from Self Drive while in other parts of the world it’s a complete opposite. This is because due to surplus of manpower it becomes easy for us to hire drivers at lower cost as compared to the international scenario. You also launched ‘Chauffeur Driven Getaways with Family’. Could you please explain about this service? The Avis India Chauffeur Driven family Getaway provide a large spectrum of destinations to chose from. These packages have been designed understanding the importance of time of the corporate executive, for people who have just a day or two available to get away from the madness of work, take a short trip and unwind with their families and friends. These packages are available at Delhi, Mumbai, Chennai, Kolkata, Bengaluru, Hyderabad and Pune the pre designed packages include fuel, toll charges, service tax and driver retention. What is the car leasing service all about and how do you see the growth potential in car leasing service segment in India? The concept of operating lease has been growing in India and major MNC and Indian corporate houses are moving towards taking cars on operating lease instead of buying. This concept enables corporate houses to offer its executives the convenience of uninterrupted mobility coupled with a high degree of personalized service in a tax efficient manner without investing in assets not core to its business. Corporate houses purchase around 10 per cent of the total cars sold in the country and out of that, only 10 per cent of the cars are leased. So far only a fraction of the leasing potential in India has been exploited and the potential for growth is huge. Avis India plans to invest Rs 7 billion over the next 3-4 years in placing 7,000 vehicles on operating lease. How has the growth rate been and what is it dependent on? The Indian car rental scenario has seen many changes since the last decade. Largely ignored so far, this sector is now being recognized as an important component of the travel trade. This has not only led to improvement in services, but also seen diverse variants of the services being introduced for both the leisure and business traveller. What is the volume of the car rental market in India and what is the breakup of the organised and unorganized sector? The car rental market in India with all mobility put together, cars, taxis, corporate today stands at around US$3 billion. 80 per cent of the sector in India is still unorganised. This means that only 20 per cent is organized and growing YoY 15 per cent. But this is a positive picture as it leaves a huge scope of growth for the industry. With the economic growth more and more multinationals are coming into India, Indian companies too are turning multinational. This has brought awareness among the corporate about that as our kind of business offers consistency, quality and IT support. This is slowly creating a migration of sorts among large corporate and multinationals. The concept of acquiring vehicles on lease purchase basis may still be new to India, but it has been around for quite a while now. The successful business model has benefited numerous corporate houses and individuals across the world by providing a hassle free vehicle ownership experience. 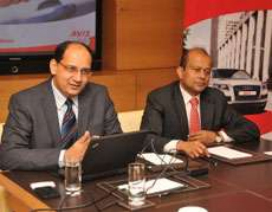 Avis is one such global company that has been providing operating lease facilities for vehicle acquisition, maintenance and disposal in India for the past 12 years and has watched the corporate sector experience its boom. The company sees tremendous potential for vehicle leasing in the Indian market and is wasting no time in trying to capture as much of a market share as possible with the launch of the Red Carpet Lease plan. Operating lease allows individuals and companies to lease vehicles from Avis for one to five years. This is of major relevance in the corporate sector as companies save a lot of money by leasing cars for use rather than having to take the expensive route of buying vehicles. Avis India, one of the major car rental brand in India has introduced `The Avis India Chauffeur Driven Getaways with Family for the weekend and Corporate Traveler. Avis says that these packages have been designed understanding the importance of time of the corporate executive, for people who have just a day or two available to get away from the madness of work, take a short trip and unwind with their families and friends. Available at Delhi, Mumbai, Chennai, Kolkata, Bangalore, Hyderabad Pune the pre designed packages include Fuel, Toll charges, Service tax Driver retention. Sunil Gupta CEO Avis India said The Popular destinations in the vicinity of your cities have been chosen keeping in mind the short weekends available at the corporate executive s disposal. They have mostly weekends to spend with their family and in such situations are always united kingdom economy on the lookout for ideal destinations closer to their homes. These one to two day packages not only allow them to spend quality time with the family without worrying about anything else but also give them a variety to choose from . Varying between Rs 4000/- for a one day return trip in a Toyota Etios for Delhi - Neemrana to a Maximum of Rs 16,000/- for a 2 day Return trip to Bangalore - Tirupathi in a Toyota Innova the packages provide with a large spectrum of destinations to chose from. I totally agree with you sir, but i know lot's of people who are true petrol head's but cannot travel with their whole family cos they own a hatchback, this will kind of give an option to such people. Nowadays Local car providers/agents have stopped providing petrol cars. eg: In our co, we asked for a Honda city for hire for a single day two times in this month both times they sent us a Diesel united kingdom economy Altis at the price of Honda city hire charge!! We aren't complaining. Avis introduces operating united kingdom economy lease in India with an investment of Rs 7 Billion Avis India, the international car rental company in the country has launched Avis Lease, an operating lease service for the Indian corporate sector. All services offered in Avis Lease have been designed by the Company keeping in mind the unique requirements of the Indian corporate. The flagship product of Avis Lease is the unique Red Carpet Lease which for the first time in India offers a comprehensive and high quality operating lease solution. Besides the Red Carpet Lease, Avis India will also offer other services like Premium Lease, Fleet Consultancy Fleet Management. united kingdom economy Sunil Gupta, CEO, Avis India while speaking at the launch said �The concept united kingdom economy of operating lease has been growing in India and major MNC and Indian corporate houses are moving towards taking cars on operating lease instead of buying. Corporate houses purchase around 10 percent of the total cars sold in the country and out of that, only 10 percent of the cars are leased. So far only a fraction of the leasing potential in India has been exploited and the potential for growth is huge. Avis India plans to invest Rs 7 Billion over the next 3-4 years in placing 7000 vehicles on operating lease.� Avis has been present in India for over 12 years and is an industry leader in quality and reliability of services. The company�s investment in technology, processes and systems enables it to provide an unmatched international experience. To spearhead its leasing business Avis has appointed Karunesh Arya as its Chief Operating Officer (Leasing). He has over 19 years of experience in managing businesses related to auto finance, car rentals and leasing. Land Mark - Lane beside Vijaya Lakshmi Super Market.